I’ve discovered that one of the few downsides to owning a very reliable motorbike is that even though you do the regular checks on it, there are times where you think, “When was the last time I checked that?”. For me recently that was the tyres, as I knew they’d been on quite a few years, so I did a close inspection, and whilst they had wear left, there was a small amount of crazing in some of the tread, and since I actually have a lot of riding to do over the winter, I decided it was time to swap them out. I asked around, checked in on GaijinRiders and I was actually surprised that for the two things I needed to know, I was getting quite a few people saying the same thing – for my bike and riding style, the Michelin Pilot Road 2 tyres would fit the bill, and the best place to get them fitted was a small shop in Setagaya in Tokyo called Speed Stars. I called them a couple of days before to confirm the tyre and the dimensions, and they’d said they’d need to order the tyres in, which I thought might mean a week or so wait – actually it would be the next evening. That’s just good service and market knowledge. The shop is about an hour from me, but it’s a decent run on a good road, so no problems there. The day I went the weather was miserable and raining, but I’m an all weather rider, so I got on the rain gear and the trusty 2006 Honda CB400 SF to make the run. The SpeedStar people come across as really friendly, and had the job done in less than an hour. I’d actually arrived a few minutes after they opened and there was already a couple of people in – I get the feeling this place is really popular. I waited in the adjoining cafe they own, where the staff were friendly, even showing me around her own bike (a nice Harley) and chatted until the new tyres were on. They’ve got a very nice atmosphere there, and it’s the kind of place which is worth stopping in if you happen to be passing in Setagaya. The pricing was good too – cheaper than NAPS, and there’s a small discount for paying cash, but even if NAPS were a little cheaper, I’d still go to SpeedStar just for the people and service. 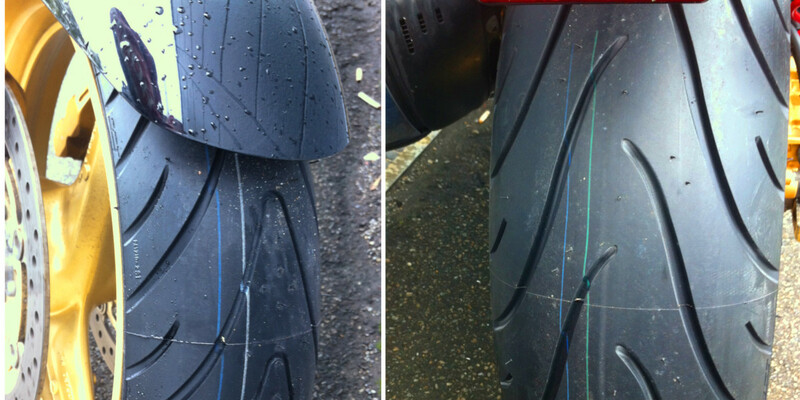 I’ve now done a few hundred kilometers on the Road Pilot 2s, and they really area a good tyre – very stable with good cornering and you can really feel the improved rolling characteristics over the old Battlax. That cornering is going to be important – I love riding the twisties. I’m looking forward to getting a few thousand more kilos under these.